Owls rule the nights. Here I have captured this wonderful bird in the figurine as a handle for the lid. 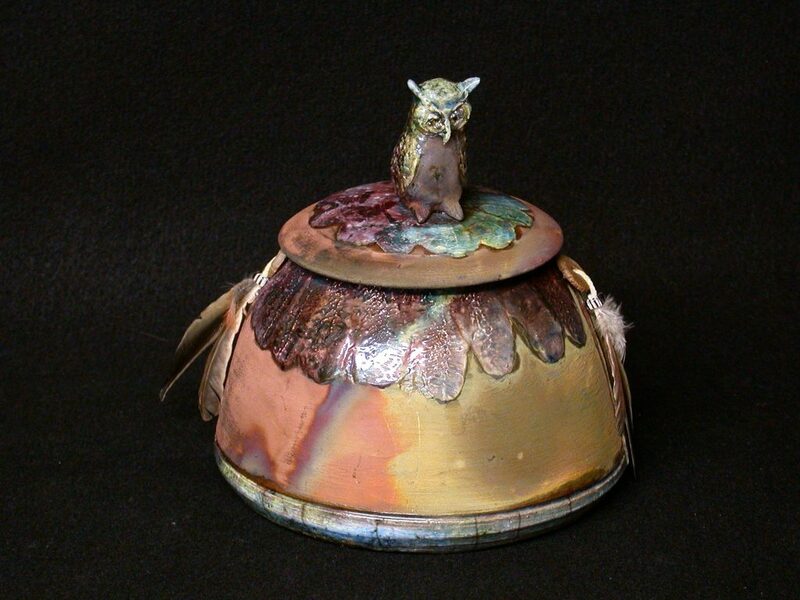 I textured areas as feathers down from the sculpture on the lid and from the rim of the base, accented them with beautiful glazes, then they were blessed by the fire, producing lots of iridescence, blues, maroon purples, coppers. I added found feathers with ceramic and glass beads attached with leather strips. I am creating these smaller spirit jars for those of you who have a small space but would like a special piece. I have additional photos if you would like to see more. Just e-mail at jinderbitzin@jipottery.com and I will send you different views.